Red Wing Shoes, started in 1905, was the the primary company manufacturing footwear for American soldiers fighting in World War I. It’s based out of the river town of Red Wing, MN, on the Mississippi River in Minnesota’s bluff country. Known primarily for producing work boots, they have added all sorts of different styles and designs, and have expanded to several other brand names as well. 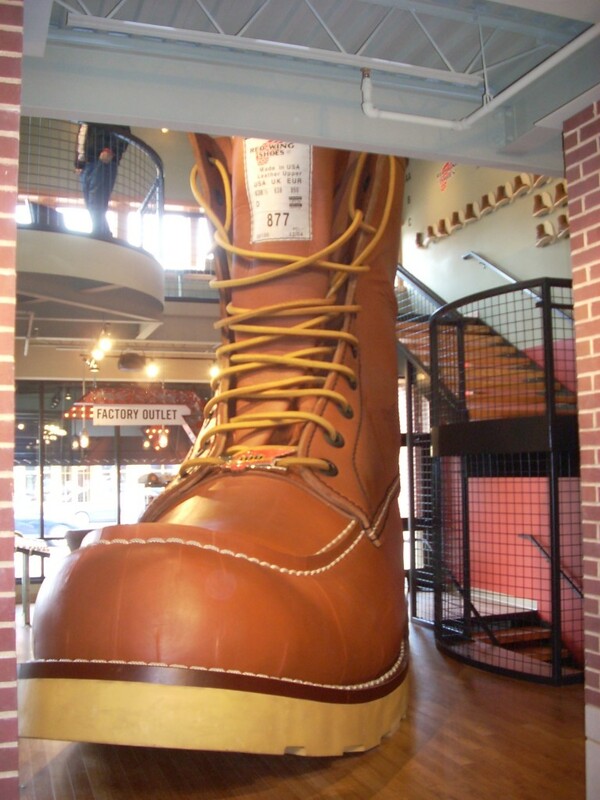 In 2007, construction began on the authentic, hand built, Guinness-certified World’s Largest Boot. It is a size 638-D, is about two stories tall, and weights over a ton. It is located at the Red Wing shoe store in downtown Red Wing, MN. You can walk right up to it and up some stairs to a small museum on the history of the shoe company. It is made with the same specs as an actual boot, only magnifed by 600 or so. While in the area: Red Wing is a very cool, historic river town with a cool little downtown area. Right past the boot is Barn Bluff, which an easy hike to the top gives you incredible views of bluffs, the river, and the town. Also just up the road is Treasure Island Casino, and Frontenac State Park is pretty close too. Just a great area. This entry was posted in Highway Highlights and tagged Minnesota Marvels, MN, Red Wing, Roadside, World's Largest by Seth5544. Bookmark the permalink. Not quite as nice as the red stiletto I saw in Vegas ;), but still pretty cool! Haha, a size 638 1/2!!!! That is sweet!!! I’ve driven by that place and then along the river. That is a really beautiful area!